We have been really looking forward to this workshop with David Lee and Marty Lau, but due to the impending threat of snow and PennDot threatening with road closures already, we have decided to cancel today's workshop and attempt at a reschedule with these instructors for a future awesome Balboa experience! For those of you who pre-registered, please know you will be given a full refund. If you do not see your refund within the next 48 hours, please do check with us. We will be attempting to reschedule as soon as possible. We hope you understand our decision in this. It was a challenging one to make and might have kept a certain someone up for a few extra hours last night. We have many people driving several hours to get here, including an instructor and we want to help to keep everyone safe! We look forward to spending some time on the dance floor with you soon. Hopefully we will see many of you next weekend, March 10th, for The Rhythm Lounge featuring Gretchen Midgley and her sidecar special from D.C.
Until then, stay safe and get some shuffle steps in wherever you may be! 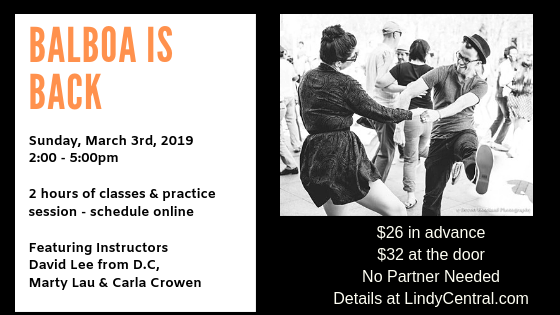 Featuring esteemed guest instructors, David Lee (from D.C.), Marty Lau (from Harrisburg), and assisted by Carla Crowen from LindyCentral.